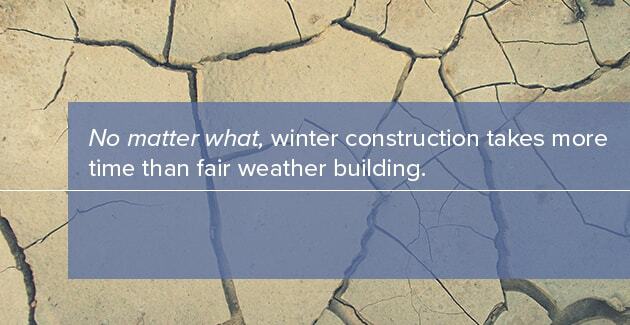 Winter conditions present a huge challenge for the construction industry. Pouring concrete is difficult when temperatures drop to near freezing. Placing concrete in cold weather can be impossible once frost sets in unless you take a lot of expensive precautions. Frigid winter conditions not only raise construction costs significantly, but they also slow schedules and reduce worker safety. Much of America is affected by winter weather, yet construction projects can continue year-round. 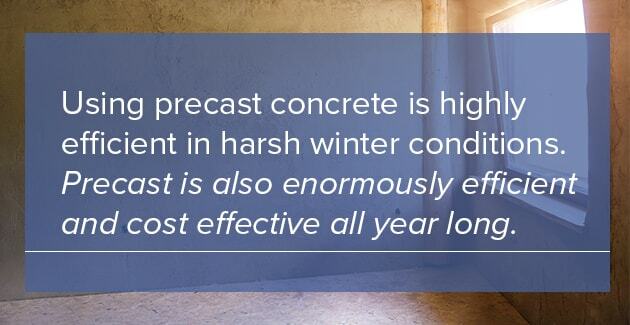 That’s because many architects, engineers and builders know that cold weather construction can easily be completed on time, within budget and safely by using precast concrete in the winter months. Precast concrete makes it possible to complete construction projects even during the extreme weather that comes in cold winter months. A daily average outdoor air temperature below 40 degrees Fahrenheit (5 degrees Celsius). Outdoor air temperature not rising above 50 degrees Fahrenheit (10 degrees Celsius) for more than half of a 24-hour period. Depending on the region, this can affect calendar months from October through April. That’s over half the year where construction projects could be delayed or halted due to frost, ice, snow or chilling winds. Builders plan for this and look at precast concrete solutions and weather adaptable concrete products. Commercial construction uses concrete for more than just foundations and slabs. Precast concrete is the best all-weather process for architectural wall panels, double T beams, hollow core planks, floor panels, beams and many more applications. 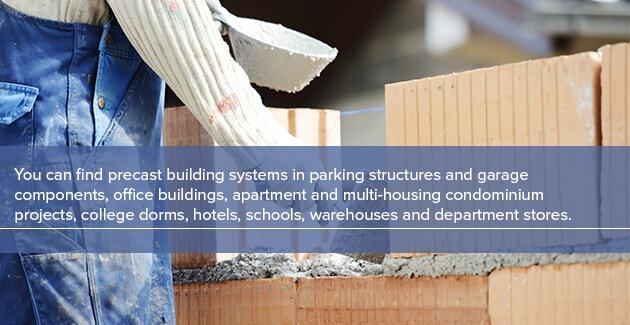 You can find precast in parking structures, office buildings, apartment and multi-housing condominium projects, schools, and almost any other large scale project. These large projects take months to plan and complete. They’re time sensitive and require continuous construction that flows through the winter months when conventional cast-in-place (CIP) methods are impractical, too expensive and not safe for the workers being exposed to harsh environments. The key to successful concrete construction is having structural components made in an environmentally controlled fabrication setting. Nothing equals concrete for strength, durability and economy. You can use it above and below ground as well as submerged in water. Concrete has helped build every imaginable structure from skyscrapers to bridges and roads. But for all of its benefits and virtues, it does have downsides. It can’t properly cure when it’s too cold when poured outdoors. That’s quite the restriction for on-site concrete pours. Traditionally, concrete projects are cast in place. Forms are set, and concrete is mixed on the job site or trucked in from ready-mix plants. Concrete doesn’t dry to harden. It transforms from a sludgy liquid state to a solid mass through a complex chemical reaction called curing. The reaction’s speed is directly proportionate to temperature. That includes the liquid concrete mix temperature and what temperature it remains at during the vital curing stage. It also includes ambient temperature, which takes in the surrounding environment like air, formwork and the ground conditions. The American Concrete Institute states the ideal temperature range for pouring concrete is between 50 and 85 degrees Fahrenheit (10 to 29 degrees Celsius). The ideal curing temperature is 72° F (22°C) over a 28-day curing period. That’s nearly impossible for most of mid-Atlantic America in the fall, winter and spring. Leaving only a narrow window of proper use of a traditional pour method. Temperatures that are too high cause the concrete mix to dehydrate and face potential strength loss, as controlled water retention is vital to ideal curing. Low temperatures cause concrete that’s curing to go inert or stop setting. Freezing during the initial cure before it reaches 500 psi compressive strength will cause curing concrete to fail entirely. Either way, casting concrete outside of its temperature tolerance can be a financial disaster. Full concrete strength occurs after 28 days. That’s when it reaches the designed strength. Concrete strength is rated in pounds per square inch or psi. Concrete mixes vary according to what’s needed. Normal design strengths start at 2,000 psi for light-duty flatwork like slabs and walks. Footings and wall mixes are usually designed to withstand 2,500 to 3,500 psi. Crucial structural members such as beams, columns and stairways are mixed for strengths as high as 5,000 psi or more. You can easily achieve all these mix designs, provided you pour them at the proper temperature. 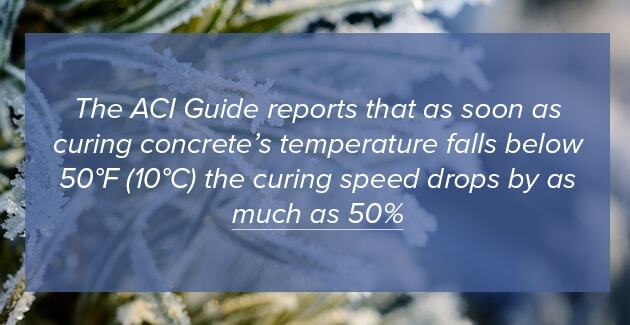 As soon as curing concrete’s temperature falls below 50°F (10°C) the curing speed drops by as much as 50%. Below 40°F (4°C), the curing process basically stops and nothing can be done to restore the process. 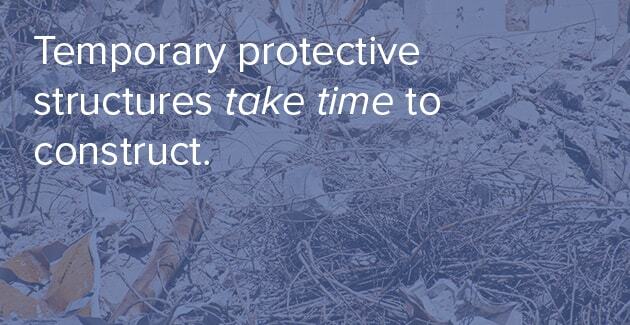 Temporary protective structures take time to construct. There are some creative solutions developed on construction sites, but they all require time to design, source materials, assemble and then disassemble. That leaves a problem of dealing with waste materials. They might be recycled into part of the overall building project, which offsets some cost. But usually, any materials associated with a concrete pour are contaminated with oil or slurry. This requires more time and expense to clean. Putting waste material in a landfill is expensive and not a sound environmental practice. Temporary structures require heating. Depending on the fuel source, this can be pricey. Propane and diesel heaters burn a lot of expensive fuel. In extremely cold weather, this can be prohibitively expensive. Exhaust fumes from fossil fuel heat create an additional problem for curing concrete. It’s called carbonation. This is where temporary heaters operate with poor ventilation and cause carbon dioxide in the air to rise. It then reacts with calcium hydroxide in curing concrete to form calcium carbonate. This reverses calcination of lime and turns the mixture into a weak chalky surface and a soft core. Insulation blankets and other insulators like foam, hay and straw have limited value without an alternative heat source. They’re adequate for marginal temperatures. But once the internal temperature of curing concrete drops, these insulators then trap in the cold rather than allowing outside heat to rise. Virtually every ready-mix concrete supplier will start adding cold-weather protection into the concrete mix once the ambient temperature drops to a certain point. These are called add-mixtures. Some are intended to raise the mix temperature. Others are designed to speed curing time. 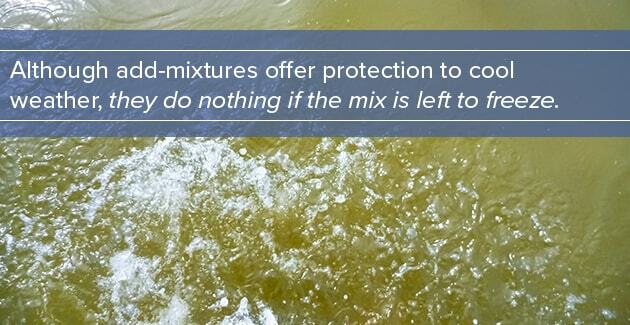 Although add-mixtures offer protection to cool weather, they do nothing if the mix is left to freeze. Add-mixtures also present their own curing problems. These are the popular cold weather concrete additives, and some of the major factors that influence them. Hot water is the primary cold weather additive. A ready-mix company will calculate water temperature depending on the current ambient temperature and daily forecast. They also take the delivery time and distance into account. A general rule is for the mixture to arrive at the cast-in-place work site at 65°F (18°C). To get a workable site temperature, the plant’s additive temperature has to be very high. The higher the additive water temperature, the higher the risk for aggregate separation. That leads to weak strength and failed pours. Neither are acceptable results. They’re always a risk when casting in cold weather. High water temperatures can cause flash setting. This is also dangerous for eventual strength. This happens when hot water directly contacts the powder rather than the mixture of powder and aggregate. Direct contact, especially at high temperature, causes the powder to instantly cure or flash-off. This prevents binding aggregates, which is the key to concrete strength. Air entrainment is another big factor in controlling concrete. Mixes are designed for specific volumes of air content. It’s critical to pour concrete with the right amount of air entrapment, particularly in cold weather. Air is a necessary ingredient in chemical reactions. Air is highly susceptible to temperature as colder air contracts and weakens a final cure. Accelerators are designed to speed up curing rate. Calcium chloride is the most common cold weather accelerator. It’s normally added at 1% by volume for cool days and at a maximum of 2% for cold days. Calcium is always present in cement powder, but by adding extra, the natural curing time is chemically boosted. But like most other additives that exceed standard concrete mix designs, excessive calcium causes strength loss. Non-chloride accelerators are available, but they can be very expensive. Many engineers and builders are unfamiliar with complex add-mixtures and prefer using what they know to be tried and true. It would be a mistake to think other accelerators act like anti-freeze. They don’t. They only speed curing. There is no anti-freeze available in the concrete industry. Slump refers to the concrete mix’s consistency or thickness. A low slump is low in water making it thick, dry and stiff. High slumps are thin and liquidy. As the goal of cold weather pours is to minimize water and maximize cure time, a thick slump is desirable. That has a distinct problem for cold weather places. Low slump concrete is hard to work in cold weather where a high slump consistency flows easily. That brings back the problem of water in cold weather concrete pours. Fly ash is another product used in cold weather concrete. It’s a by-product of steel production similar to slag. Contrary to popular belief among some builders, fly ash actually reduces internal heat and curing. Use of Type III cement, which is a high-early strength cement, commonly used in precast concrete but not commonly used in ready-mix concrete. It is slightly more expensive than the typical Type I (general purpose) cement, but it is beneficial for getting high early strength which is important in cold weather concreting. Precasters use it all year-round. Because water can’t be absorbed quickly in cold concrete, it tends to escape to the outer surface of the curing product. This is known as “bleeding.” Water is the lightest ingredient in a concrete mix, and it naturally floats to the surface if it can’t be absorbed internally. Bleeding hurts finished concrete in two ways. One of these ways is by making the outer surface difficult to work with. Any attempt to trowel standing water back into a setting concrete mass will only weaken the top surface. Secondly, if a top layer freezes, the surface will never cure correctly and can spall off or flake away indefinitely. Ground temperature is another big factor when casting. Concrete should never be placed on the frozen ground or in any conditions where ice or snow is present and will be exposed to a fresh pour. This is a recipe for construction collapse. 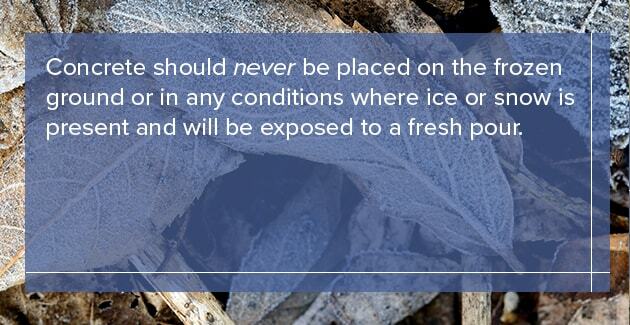 Even if you have a temporary shelter or insulative protection, frozen ground will stop curing in its tracks. Heating the area after pouring simply won’t work. Neither will any type of cold weather add-mixture help with frozen ground. Fortunately, there’s a simple solution to casting concrete in place during cold times. That solution is not to do it at all. Precast concrete is the ideal remedy to eliminating all the problems associated with cold weather pours. Precast concrete components are carefully constructed inside factory-controlled environments that remove all the risks. This results in regulated units that meet high standards in quality, strength, and design. No matter what the weather condition is outside. Here are the benefits of having concrete structural components precast. The process is available for every type of project. Designed by knowledgeable engineers. They’ve had years of training and hands-on experience in casting all types of concrete structural They work with the architect, project engineer and construction manager to make sure exactly the right concrete mixtures and additives go into the precast pour. Factory conditions mean temperatures are artificially controlled to ensure optimum conditions exist when a component is cast. All concrete casting and curing is done in these conditions, which eliminates volatile job variables like unexpected weather drops when a pour has been scheduled and must proceed. Quality control is ensured by an internal batch plant where the precise aggregate, powder, water and other additives are mixed at a consistent temperature. There’s no guesswork or taking a chance. Strength is guaranteed. It doesn’t matter what the required strength of the concrete is, the builder is guaranteed that concrete strength will be there. All precast concrete orders are verified with on-site quality control measures and have supporting documentation that always meets design specifications. Typical precast concrete strengths are at least 5,000 psi and can sometimes be as high as 10,000 psi no matter what the outdoor temperature is. Durability is never a worry. No other building material lasts as long as concrete. It won’t rot like wood, rust like steel, crush like plastic or smash like glass. Fire resistance is extremely high with precast concrete products. In fact, concrete is non-combustible and has an extremely high failure temperature. Fast delivery times are certain with precast concrete component. Because they’re poured and cured in a dedicated plant setting, the works can be done months in advance and then stored in staging areas. There’s no on-site rush to contend with in limited space. Provided the components are ordered on time, they’ll always be ready to go when you need them. Cold weather curing when grouting joints between precast members in the cold weather, measures to protect grout curing are simple and inexpensive in comparison to heating a large pour of cast-in-place concrete. Cost-effectiveness is ensured when using precast concrete. Job time and worker labor are significantly reduced by pre-casting components. That labor saving is passed on in reduced overall costs that can be found in profit. All of these are great benefits from using precast concrete, but they can be wrapped up into one main construction advantage. 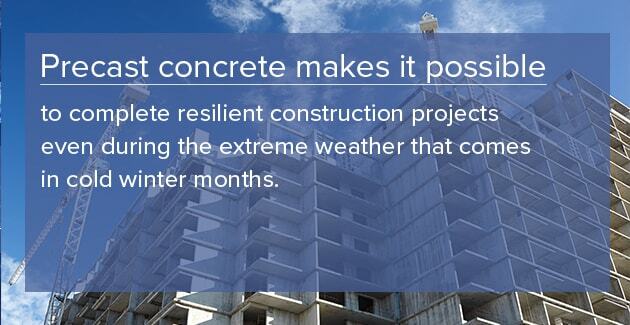 Using precast concrete is highly efficient in harsh winter conditions. Precast is also enormously efficient and cost-effective all year long. Choosing precast concrete will keep you on budget even in those cold months. To discuss your project with one of our specialists, give us a call or send us your project details right here online!